Sept. 26, 2012 - - The Modesto Police Officers Association (MPOA) has launched an outreach effort to raise community awareness of a web-based application that makes crime data available to all Modesto residents on a daily basis. The "Yesterday in the Lives of Modesto Police Officers" site will highlight www.Crimemapping.com which maps each police call incident in Modesto for the preceding 24 hour period. "We want the public to know what we do and emphasize how important it is to have an aware community partnering with law enforcement in improving public safety, "said Tony Arguelles president of the Modesto Police Association. "This site will not only map out the preceding day´s incidents, it will also allow us to highlight news, crime fighting tips and information on a daily basis." Arguelles explained, "CrimeMapping.com gathers crime data from the Modesto Police Department (MPD) on a daily basis and our goal is to use this publicly available data to raise the awareness of Modesto citizens about crime in their neighborhood." Crime data is extracted on a regular basis from the department´s records system so that the information being viewed through a Web browser is the most current available. This data is always verified for accuracy and all address information is generalized by block in order to help ensure privacy is protected. The use of Crimemapping.com builds on the Modesto Police Department´s innovative use of social media, pointed out Arguelles. "The department´s recent virtual ride-along program was a huge success," explained Arguelles. "The department used Twitter and Facebook to provide Modesto citizens a glimpse into the activities on a particular shift. It allowed Modesto citizens to better understand the wide range of calls our officers respond to daily. 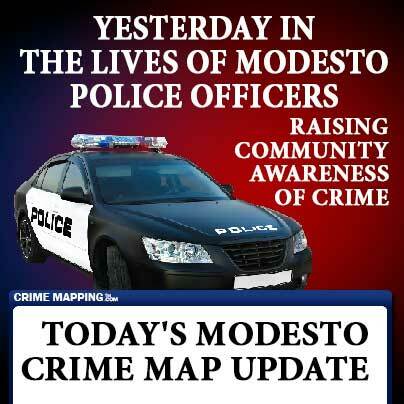 We believe the use of Crimemapping.com will be another tool in efforts to educate the public about crime in Modesto." Additionally, Modesto citizens can go to www.CrimeMapping.com and register to receive free, customized daily reports via email listing all criminal activity within a specified radius of their home or business. Users can choose from among 15 different crime types including robbery, assault, burglary and theft. "Transparency helps build trust," said Arguelles. "Community oriented policing is important as we deal with increased demands for service in the face of diminished staffing levels. Modesto police officers are dedicated to working with the community and helping to fight crime to make our city a safer place to live."